Seafood is extremely perishable. Quickly freezing it at the height of freshness (usually when it’s still on the boat or shortly thereafter) is a successful way to keep the flavor and texture. When purchasing frozen seafood, look for solidly frozen pieces with few ice crystals to ensure they have not thawed and re-frozen at some point before purchase. Keep the seafood frozen until you are ready to use it by storing it in the coldest section of your freezer, on a low shelf towards the back. When you are ready to use the frozen product, you may safely defrost it in one of the following three ways: in the refrigerator, under cool running water, or in the microwave. Microwave ovens work by shaking up the water and fat in food, which in turn, makes heat. Covering food with microwave-safe plastic wrap or putting it in a microwave-safe, covered casserole dish locks in steam. The combination of inside heating and outside steaming cooks items in less time than it would take otherwise. Microwaving is particularly suited to cooking thin, skinless fillets of fish. Begin by arranging the fish in a single layer in a microwavable dish. Be sure to tuck slim pieces under, or overlap thin edges to ensure even thickness. This will prevent overcooked, tough ends. Moisten the fish with a small amount of seasoned liquid or broth, but do not submerge it completely. Microwave on full power or using the “fish” setting until the fish is mostly opaque and just begins to flake—about one and half to five minutes. Allow the fish to stand for a short time after microwaving to complete the cooking process. This method works best when cooking small portions or when you don’t desire a browned exterior. Many fish and shellfish benefit from a quick soak in a marinade to boost flavor and help retain moisture. Even so, use care when choosing marinade ingredients and limit the seafood’s time in the marinade so as not to overwhelm its natural flavor. Usually half an hour is enough time to add flavor to a delicate piece of seafood: less time is needed if you are using a strong acid in the marinade, such as lemon juice, which chemically “cooks” the food and alters its texture. Experiment with different marinade ingredients, and gradually increase the amounts added or the time the seafood is kept in the marinade till you achieve a flavor balance you like. Most marinades consist of varying proportions of oil (flavored or flavorless) an acid (white wine, fruit juice, or vinegar) and spices or herbs. For Asian-inspired marinades, choose soy sauce, scallions or sesame oil as the primary flavoring agents. Marinades with a Southwestern flair might include the flavors of cilantro and lime. 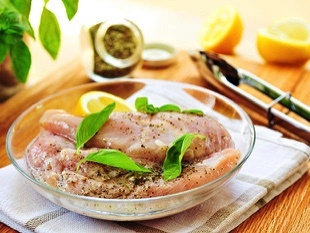 Try flavoring marinades with fresh basil and parsley for an Italian twist. No matter which combinations you choose, season lightly with salt—you may find that you prefer less because the seafood is already deeply flavored (and you can always add more salt once the seafood is cooked). For easy cleanup, marinate seafood in a food-grade plastic baggie with a re-sealable top. Always marinate under refrigeration and throw out used marinade to help prevent food borne illness. Remove excess marinade from seafood before cooking to help prevent flare-ups when grilling or broiling. Pan searing is a technique that works well for cooking fish steaks and thicker, shorter fillets of fish. If the fish has skin, score it on the skin side with a few vertical slashes. This will help the fillet from curling because the skin will shrink as it cooks. Dry the fish thoroughly and season with salt and pepper if desired. Begin by heating a low-sided, well-seasoned skillet on the stovetop over medium-high heat until warm. Add about a teaspoon of oil, swirl the pan to evenly coat it, and heat until almost smoking. Add the seafood, placing the side you wish to present in to the hot pan first. Keep multiple pieces separated. Do not touch or move the seafood until it is browned on one side. You may have to adjust the heat to so that the seafood browns evenly but does not burn. Turn the seafood once it is about halfway cooked through—you can guess the halfway point by looking at the side of the fish, which will appear opaque on the side closest to the bottom of the pan and translucent on the side that is facing up. It may be useful to use two large, flat spatulas to help you flip the fish. Continue cooking on the second side until the fish begins to reach a final cooking temperature of 140 degrees, or the meat just begins to flake and becomes opaque. Remove from the pan, rest two minutes, and serve. Plan at least a day ahead if you choose to defrost in the refrigerator. It will take about 24 hours to defrost a bulky frozen item, or several pieces of food that have been frozen together. Place frozen seafood in a clean container to catch the liquid released from the product as it thaws. If the frozen seafood is not already wrapped in plastic, cover the top lightly with plastic wrap to protect it from coming in to contact with other foods in the refrigerator. Place the container on a low shelf and defrost slowly over a day. After thawing, remove any liquid that has collected in the packaging and use within a day for optimal freshness and safety. Use this method when you have less time, but are able to more closely watch the frozen seafood. Begin by placing the food in a leak-proof plastic bag (if it is not in one already). Submerge the seafood in cold tap water and change the water every thirty minutes until the food has defrosted. Do not try to speed the process by defrosting in hot water because this will encourage bacteria on the food to multiply. 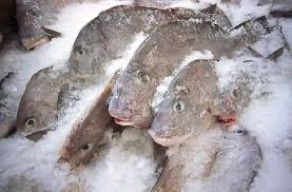 Cook seafood thawed under cold water immediately after thawing. Follow the manufacturer’s instructions for choosing the appropriate microwave defrost setting and defrost until the food is cool and pliable. Be careful not to overheat—this will start the cooking process. Cook seafood that has been microwave-defrosted immediately after thawing.